Pinkwashing has reached a new low this year. In the past, we’ve worked to demand accountability from companies who pinkwash in the name of breast cancer. We’ve seen pink alcohol. Pink buckets of fried chicken. Pink hormone-laden yogurt. But we’re genuinely shocked to see a breast cancer organization marketing a product containing multiple chemicals categorized as toxic or hazardous. Susan G. Komen for the Cure commissioned and is now selling a perfume called Promise Me. This perfume contains chemicals that are a) categorized as toxic and hazardous, b) have not been adequately evaluated for human safety, and c) have demonstrated negative health effects. Please join us in demanding that Komen take every precaution when it comes to our health. When in doubt, leave it out! Raise A Stink! by sending a letter to Susan G. Komen for the Cure asking them to stop pinkwashing! Galaxolide, a synthetic musk that works as a hormone disruptor and is detected in blood, breast milk, and even newborns. Toluene, a potent neurotoxicant known widely as one of the toxic trio, has demonstrated a variety of negative health effects and is banned by the International Fragrance Association (IFRA). When women’s lives are at stake we must adopt the highest standards of accountability. Komen is taking initial steps to reformulate the perfume “to remove any doubt about the ingredients.” But we’re still deeply concerned that while Komen reformulates, a product that is potentially harmful to our health is still in stores and in our homes. We urge Komen to immediately recall Promise Me. Send a letter to Komen asking them to take every precaution when it comes to our health. Ask Komen to immediately recall Promise Me and sign our Pledge to Prevent Pinkwashing. Thank you so much for taking action. Together we will stop pinkwashing because ACTION SPEAKS LOUDER THAN PINK! Please stop production of your perfume. Talk about awarness!! Thanks for making me aware of this !!! Please use natural ingredients to protect everyone! Possibly Roses would be better! 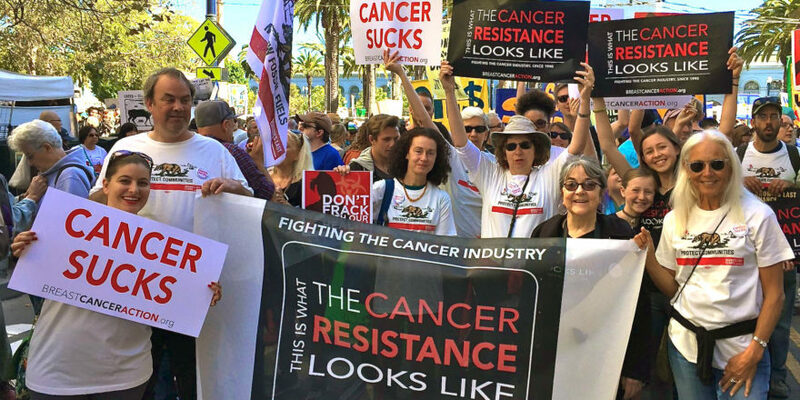 Given the fact that most cancers are caused by environmental toxins, you would think that an organization that claims to support cancer research would put more thought (and research) into products that they promote. Maybe they aren’t aware of these facts – they are so busy raising money and reminding women to be afraid of cancer. Personally,I think their money would be better spent educating women on PREVENTION of cancer; i.e. better nutrition, awareness of toxins to avoid, the advantages of exercise, etc. I have signed this or a similar petition before, and received a response from Komen that they had no intention of recalling the toxin laden original perfume. I am signing again to ask them to step up to the plate and take truly meaningful action to protect women from cancer by RECALLING the original formulation from the shelves and from peoples’ homes. Yes, a product recall is inconvenient and costly, but so is cancer. Komen should do better than other industries and corporations to set an outrageously good example, not adhere to the same standards that polluting corporations use to evade responsibility for the damage their products cause. Hey, Komen, think of a recall as a publicity stunt, and you can write off the costs under your advertising budget! Pingback: Three reasons I wish I could quit you, Susan G. Komen!